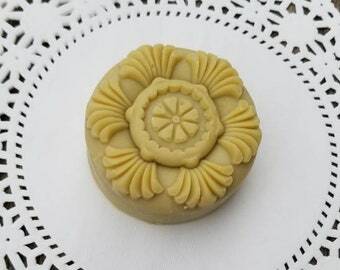 The Yellow Rose of Texas Soap – beautiful loaf full of rose buds, succulent blend of Lemon, Grapefruit, Peach Nectar, Raspberry, Pink Tulip, Soft Jasmine, Magnolia, Wild Honeysuckle, and Sheer Musk scent. This loaf of yellow roses you can cut it into 8 soap pieces. Handmade soap will last a long time if kept dry between uses. Your order is being made especially for you at the time you place it. Please allow up to 2 weeks before these will ship via USPS Mail. A tracking number will be provided to you at the time of shipment. This soap is amazing.Smells so good and truly gorgeous.Came with the cute as a button extra too. We do offer to create custom orders with a minimum order of 10 bars of soap. These would be perfect for gifts or favors. If you would like to buy more items than I have available, please feel free to contact me! I am always happy to answer any questions and work on custom orders. Please contact us if your interested in wholesaling our products.